Curry hummus on my mind. See, it’s January 8, it’s cold, it’s raining, and I just made a big batch of homemade pita bread. I need something to dip it in, and I want something spicy and flavorful, hearty and healthy. Like hummus. But not just regular, boring hummus. Not olive hummus, or spicy hummus, or even roasted garlic hummus. Something more exciting to brighten up this dreary January day and turn this pile of warm, homemade pita bread into a satisfying lunch. 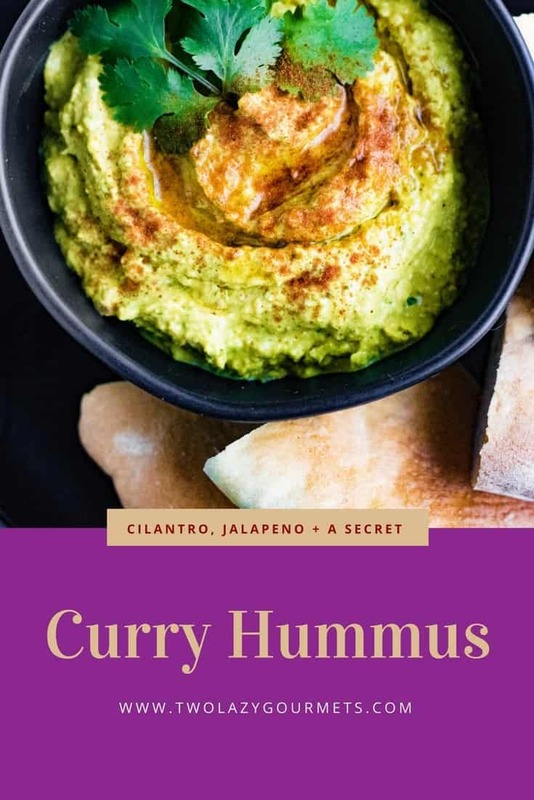 Curry hummus! That’s it! Supermarkets have entire refrigerated shelves devoted to different flavor of hummus, from roasted red pepper to pumpkin spice. 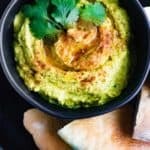 The internet is rife with hummus recipes from simple traditional versions to peanut butter and chocolate chip hummus (no, seriously!) 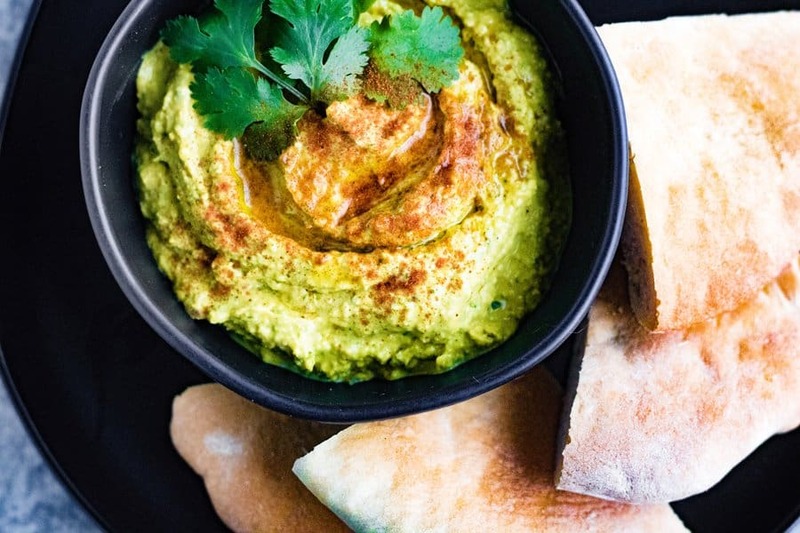 Why don’t you ever see curry hummus? Suddenly, I have a plan. The rain lets up, the clouds begin to break, a sliver of blue sky and sunshine offer hope. Fifteen minutes later, I’m enjoying delicious, spicy, tangy, flavorful curry hummus with a secret ingredient that balances out the slight bitterness of curry powder and tahini with a hint of sweetness. And that secret ingredient—in fact, most of the ingredients—are likely already in your pantry! 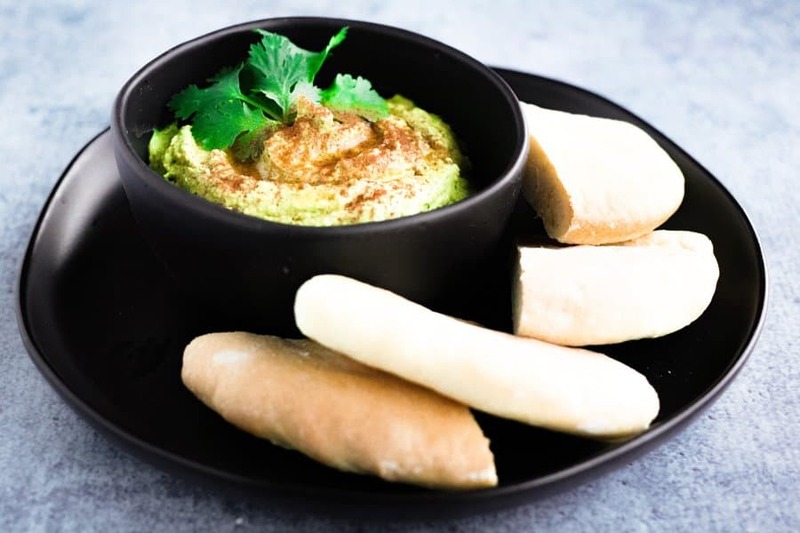 This curry hummus is loaded with flavor from curry powder, tahini, spicy jalapeno, and cilantro. Plus it has got a secret ingredient that cleverly balances out the slight bitterness of curry powder and tahini. 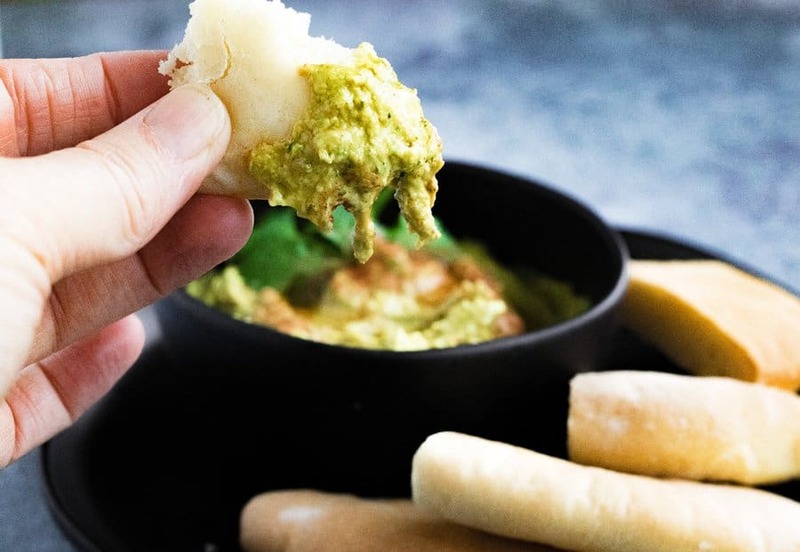 You can make it in a flash from common pantry items, and it makes a healthy, delicious snack. It’s the perfect thing to dip your homemade pita bread (or your store-bought pita bread! Or veggies, crackers, or pita chips!) into. Put the raisins in a small bowl and cover them with about 3 tablespoons of hot water. Let soak for 5 to 10 minutes. Meanwhile, in a food processor, combine the garlic and cilantro and process until finely chopped. Add the garbanzo beans, tahini, lemon juice, curry powder, paprika, jalapeno, and the raisins along with the soaking liquid and process until smooth. With the motor running, add the oil in a steady stream until well combined. Taste and add salt and/or additional curry powder as needed. Serve immediately or store, covered, in the refrigerator for up to a week.